Were the French Championship a 14-runner Cheltenham Gold Cup then the leaders would be turning for home, 10 of them still in contention, most still on the bridle, and no punter however well-informed able to offer an honest appraisal of which one will finish first and which tenth. Of the other four, just Biarritz fell off the pace on the first circuit and are now tailed off while Bayonne, Perpignan and Oyonnax are blowing hard and desperately trying to avoid the calamitous consequences of finishing 13th. With the Six Nations now taking precedence and the next full round of matches not scheduled until the weekend starting March 21 it is a good time to pause for thought and have your card marked. As things stand after 145 matches and the distribution of 688 league points, the clubs in first and tenth places are separated by just 10 points. Five rounds remain. It's the most competitive ever conclusion to a Top 14 season. For all the uncertainty off the pitch in European rugby this winter, for 10 clubs in France there is a week-by-week fear on it that a slipped bind here or a missed touch there may well end hopes a Top 14 play-off berth and no place in Europe's top flight competition in the autumn. The most likely contenders to finish top are those two old friends Toulon and Clermont Auvergne. They are together at the top of the log with 60 points. It is fair to say that a rivalry rather keener than that anticipated between two powerhouses has developed with Mourad Boudejellal stoking it up like Mickey Duff ahead of a world title fight. In one of his more memorable rants the Toulon president dubbed Clermont "The Trolls of the Massif Central". Toulouse have been the loudest dissenters over the new agreement which has given Philippe Saint-Andre greater control over France players. They provide more players for the France squad than any other club so you could argue their bleating is understandable. But then the Six Nations and November series of internationals are annual calendar entries and not spontaneous Acts of God. Toulouse coach Guy Noves acknowledged almost a year ago that Toulon's recruitment policy is more savvy than theirs. Yet despite having a bigger overall budget than those of Castres and Perpignan added together there is little evidence of them doing much about it. The détente between club and country has yet to bear fruit. In January, Saint-Andre got his 23 for the Six Nations opener against England excused from the previous weekend's Top 14 matches but the flood of bad blood was stemmed for just a fortnight with Toulouse leading the defiance of the national coach's request the 12 players who had started against both England and Italy be given the weekend off by their clubs. Noves even picked one of them to start at Biarritz, Jean-Marc Doussain, so when the scrum-half was replaced at half-time in the following Friday's Cardiff calamity there appeared something sinister in Saint-Andre's explanation that he was withdrawn because he looked jaded. In fairness to Saint-Andre there has been plenty of evidence in the treatment rooms and even the LNR's disciplinary court over the past month that an England-style accord would make his job far easier. France's two best hookers Benjamin Kayser and Dimitri Szarzewski have both been injured in club matches since the Six Nations started - as has Yannick Nyanga - while Morgan Parra could have been saved from himself. Just hours after being told he'd been recalled to the squad Parra was sent off playing for Clermont against Montpellier for butting Rene Ranger. 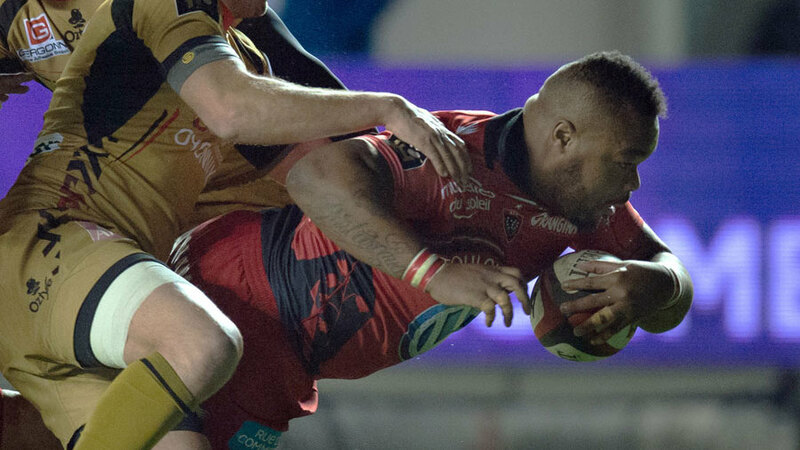 The two sides meet at Clermont's Stade Marcel Michelin on March 21 in what will play a huge part in determining the league phase's top finisher. Clermont will go into the game on a 73-match winning streak at home; Toulon, on the other hand, have won their last four matches and after an uncertain phase are starting to look more like their 2012-13 selves. The consequences for the loser are potentially grave. A home defeat - the last was in November 2009 - would be seismic for those in volcano country while Toulon will have to pick themselves up from the canvass in preparation for another crunch encounter the following weekend when they host Toulouse. All three of them are also supposed to be tapering off for Heineken Cup quarter-finals over the first weekend in April. Toulouse (equal fifth on 55 points) have reached the semi-finals of the French Championship for each of the last 20 seasons and haven't finished out of the first four in the league for 38 years. Yet despite having turned things around a bit over the past three weekends they are still not out of the woods. Over the same weekend as Toulon are at Clermont, they are in Paris facing the rejuvenated Stade Francais (fourth on 56 points). Just two of the Rouge et Noir's five remaining games are at home. Beneath Toulon, Clermont, Stade Francais and Toulouse there are half-a-dozen others who have grounds for optimism. Montpellier are in third on 57 points and, like Toulouse and defending champions Castres (55 points), have just two of their five remaining matches at home. In previous seasons such close proximity for traditional "top sixers" would not be so worrying. The problem for them is that there are four others biting at their heels. Racing Metro (52 points), Brive (51 points), Bordeaux-Begles and Grenoble (both 50 points) are all within one good result of sending more accomplished rivals into a tailspin of panic. Racing, who flopped in Europe and have been utterly uninspiring in France, also have just two home games left. One of the away trips is the Paris derby in round 23. It's the first time both clubs have been in play-off contention for years and promises to be quite a match. Brive are the least likely of the 10. Indeed, it's a minor miracle they have got themselves into this position. They have collected a maximum of 10 points from their last two home games (against Stade Francais and Grenoble) and in all likelihood will have to spring a surprise at either Castres or Toulouse as well as win both remaining home games (one of which is against Clermont) to make the play-offs. Bordeaux-Begles and Grenoble are the teams with most to gain from what remains of the league phase. Both have a run-in more attractive than that of any of the eight above them. For starters, Bordeaux have a game in-hand following the postponement of their trip to Oyonnax. They'll fancy getting something out of that as well as from their next match at Bayonne. Of their three home games just the visit of Toulon looks tricky. Mind you, in last season's fixture they beat the European champions 41-0. Grenoble have faltered in the last fortnight. A first home defeat of the season by Biarritz may prove expensive and their capitulation at Brive on Saturday was concerning. Yet they too have three homes games left as well as the Alpine derby at Oyonnax. All in all, it's easy to see how both Bordeaux and Grenoble could pass five of the eight teams above them. At this stage, I would normally be tempted to stick my neck out and tell you with great assurance just which six sides will prevail on May 3 and live to fight the barrage matches and beyond. But, frankly, to do so would be to tell porkies and mislead. If I was a follower of either Clermont or Toulon then I would be quietly confident. As for the others, it is simply too close to call.